In the end, sales is about closing deals. Just like football is about scoring. But just like in football, sales is not just about scoring, you have to have a good strategy and you have to understand you opponent or prospect. But when it comes to scoring, there are some incredibly nifty techniques that help you seal the deal. This post discusses one of my favourites: the half Nelson close. 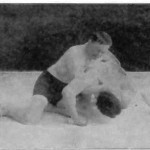 The name of the technique comes from a wrestling technique called the half Nelson, which in turn is named after the British war hero Admiral Horatio Nelson, whereby the opponent’s neck is locked by pulling your arm under his and over the neck. Just like in wrestling the half Nelson close in sales is about gaining the upper arm. A half Nelson close is very similar to a direct close in that sense that you ask directly for the sale. The difference is that you present your prospect with a condition that is favourable to him. The idea is that the prospect is presented with this extra positive information that makes him decide to buy. The trick is to get your prospect to commit to buying straight away. Make sure you phrase your closing line in such a way that your prospect can only benefit from the additional information if he commits immediately. Now, if you want to use this technique to its fullest potential, this is how you structure your pitch. In you presentation, make sure to get your client interested in your product. Get him excited about the offer, but don’t give away the best aspect (e.g. a special discount offer, or an additional service). This will be the ace up your sleeve. Then ask your prospect what he thinks of the offer. If he sounds excited already, you can easily seal the deal by telling him about the special offer. The half Nelson close is very powerful if used correctly. Practice it regularly and master it. If you do, it will definitely help you sell more, I guarantee it!